Jennifer Gerelds, mother of four school-aged brave girls, has been writing devotional books for children and adults for almost 20 years. In addition to the Brave Girls series, she has written for Magnify, God's Little Princess and God's Mighty Warrior brands, Precious Moments, and numerous other children's devotionals. Her adult devotional works include Shine On Beautiful Soul! and When God Thinks of You, He Smiles. Jennifer and her husband, Todd, have been married over 20 years and currently live in Birmingham, Alabama. Brave Girls: Beautiful You A 90-Day Devotional By Jennifer Gerelds is a wonderful devotional for girls! I love that this devotional encourages young girls to appreciate themselves as God made them and helps them grow strong in their relationship with Him. My daughter has been reading this devotional every morning and I've seen a complete shift in her attitude about beauty. I love that the devotionals are 1-2 pages long, begins each day with a Bible verse, followed by a story and ends with a prayer. There's also a few fill in the blanks which is a great way to really get kids involved. 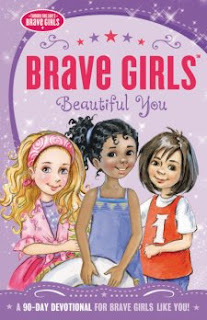 My daughter and I love the Brave Girls Series and can't wait for the next one! You can find Brave Girls: Beautiful You A 90-Day Devotional By Jennifer Gerelds on Amazon, Barnes and Noble and other bookstores.